The Faculty of Forestry is committed to providing undergraduate students with valuable field experience to complement the theoretical education received in the classroom. Our goal is to create a learning experience that provides you with a sound knowledge base in your study area, while helping you develop the technical, leadership, and communication skills that employers are seeking. Each field school gives you the chance to work closely with your fellow classmates, professors, and key individuals employed in the resource sector. While studying in an outdoor setting, you will have the opportunity to apply your knowledge and experience in achieving solutions to real-world resource management problems. 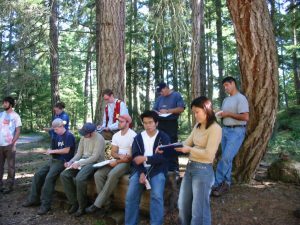 Held at the Alex Fraser Research Forest in Williams Lake, B.C, FRST 351, is designed to develop a student’s understanding of the diversity of the BC central interior (Cariboo Forest Region) forests and forestry practices, concentrating on land use, management, and silviculture. This course is required by all B.S.F. and B.Sc.(Forestry). students, but is open to any interested students who meet the course prerequisites. The Coastal Field School – FRST 452, is held at the Malcolm Knapp Research Forest in Maple Ridge, B.C. This course exposes students to the large variety of coastal forestry management issues relevant to developing comprehensive diagnostic and prescriptive skills expected of a professional forester serving a host of clients with diverse values. This course is required by all B.S.F. students. CONS 451 is the capstone course of the B.Sc. (Natural Resources Conservation) Program. Students participate in a semester-long field course that focuses on alpine, grassland, and aquatic ecosystems within B.C. A week-long field trip is taken to each of these three ecosystems. Emphasis is placed on understanding the biological and social aspects of conservation problems while developing practical field skills. Students learn about the ecology of flora and fauna in each ecosystem, gain an appreciation for resource use issues and land use plan development, experience hands-on data collection and analysis, contribute to an ongoing restoration project, and improve writing skills by producing scientific reports. International Conservation and Forest Ecosystem Management Field School is an intensive course to run in the first term of the summer semester. Reliance on forests for their products and services is a global occurrence that varies widely among countries in its applications, governance, and implications to people and wildlife. Cultural values and the depth of their influence on policy, decision making, and actions can only be appreciated by first-hand observation and thoughtful comparison. Through the examination of forest resource systems and conservation efforts, we can gain greater understanding of the complexities we face as global citizens and inform our future decisions. Course activities will involve travel to Northern and Southern India to engage in field tours, interviews, lectures, field exercises, and workshops. There will be an emphasis on practical application of skills and concepts to issues in Indian forestry and conservation, as well as the development of oral and writing skills for a scientific audience. Students will engage in collaborative work with Indian students of a similar background and skill set to develop and conduct a monitoring plan for a given area while in India. Wood Machining Skills is a seven-day-long course held in the machine lab at the Centre for Advanced Wood Processing. In this hands-on course, you have the opportunity to practice safe working procedures, work with modern wood processing machinery, practice some supervisory skills and develop an understanding of manufacturing processes. By the end of the course, you will have designed, planned, and manufactured your own piece of wood furniture. In order to develop leadership and teamwork skills, you will have the opportunity to work with several other students planning, organizing, and structuring the working day for the rest of the class. This course is held at the end of second year and is required for all B.Sc. (Wood Products Processing) students. Mill Site Visits is a one-week tour of wood products manufacturing operations in the Interior of British Columbia. Students travel by tour bus as far north as Prince George or Quesnel and then work their way back towards Vancouver visiting a wide range of mills. Operations typically visited include: sawmills, plywood mills, OSB mill, Glulam and CLT plant, wood pellet plant, timber frame manufacturer, and board mill. Students will also tour some of the forest operations at the UBC Alex Fraser Research Forest spending one or two nights at the Gavin Lake camp. Accommodation and transportation is arranged by the Department of Wood Science. The course is held in the middle of the multiple WOOD 305 sections and is required for B.Sc. (Wood Products Processing) students.